Although it is possible to measure sound quality objectively with special tools and devices that detect how accurate the given copy reproduces the original sound, most people do not have the tools and knowledge. To some extent quality can be estimated subjectively, but it's hardly a reliable method. This article provides some general guidelines regarding sound quality. MP3 is one of the most popular audio formats, and most music is stored / distributed in this format. It's a lossy format, which means that a copy in the MP3 format is somewhat "worse" than the original audio. Parts of audio information are discarded, when you convert audio into MP3. Like with other modern lossy audio formats, so called "perceptual coding" is employed. This method discards pieces of audio information that are less important to the human ear as first. The main advantage of all lossy formats is smaller file size, compared to lossless formats. Because of "perceptual coding" this does not always mean that "lossy" files sound worse than "lossless" ones. An MP3 file with decent bitrate and frequency values may loose only inaudible information. However, one should take into account that sensitivity changes from person to person, so "inaudible" is a relative term. There are 3 main parameters of an MP3 file: number of channels (stereo, mono, with variants like joint stereo), frequency (sample rate) and bitrate. Stereo 44 KHz 128 Kbit/s MP3 files are considered to be 'sufficient' for music (with bitrates and frequency lower than that quality degrades too much), but bitrates like 192 Kbit/s or higher are recommended. Using bitrates higher than 320 Kbit/s is meaningless, as size of such files is comparable to lossless while the files are still lossy. Lossless formats keep everything the source audio has, so files in these formats are identical copies. On the other hand, they are bigger (sometimes much bigger) than the same audio in lossy formats. Examples of lossless formats include FLAC, APE, WAV, MPC, etc. For backup purposes, using lossless formats is the best option. Lossy formats are perfect for portable devices: smaller file size allows saving more songs to the limited storage of a portable device. While some portable players support lossless formats, it's rarely reasonable to prefer them. Lossless formats are also the best choice as an intermediate medium. For example, if you want to burn MIDI files as an Audio CD, you need to convert MIDI to some audio format with MIDI Converter Studio and then burn the resulting files with a program like Audio CD Burner Studio. Of course, you can convert MIDI to MP3 (lossy), but it would be more reasonable to convert MIDI to WAV (lossless) and then feed the WAV files into Audio CD Burner Studio. Converting from lossy to lossless is possible, but one gets bigger files with the same quality. While this type of conversion is meaningless, it does not do any harm. As a different sort of example, we can consider converting 128 Kbit/s MP3 to 320 Kbit/s. In this case, we get not only bigger files, but also worse quality! Remember, MP3 is a lossy format, so every time you convert such file, some portion of audio data is discarded. 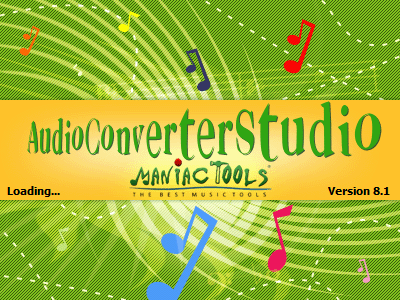 AudioConverter Studio supports popular lossy and lossless formats and can convert audio from one format to another. << Ripping Audio CD: What Format?